Animation Demo Reel Tips - Are Viewers Bored? When you ask people about your demo reel they might tell you, “yeah it is really good”. How do you know they are not lying? Did they even watch the whole thing? Well luckily for us we can use software to our advantage. Using a free video player that a lot of Internet Marketers implement we can find out the answers! I give you Wistia.com, a video player, ssas company, that prides itself in taking amazing analytics. Wistia.com provides wonderful tools like the ability to see when visitors skipped, rewound, or left your video. Their product lets you visually the viewing trends of your audience. You can even ask for the user’s email address when they play your video. Plus, they provide a premium video player that will work on any device! The pricing might be scary at first glace. But, don’t worry and simply get the free account. This will allow you to host your demo reel and get all of the analytics you need. Get a free account. I wouldn’t be good at making animation demo reel tips if I had you spending money! Upload your demo reel and customize your player. Once done load it onto your web site. Personally, I like to place it twice on my web site. Once on a page that everyone can see by simply navigating the links. Another, on a link that I provide only to recruiters. Why give recruiters a separate link? Well I will tell you. So you can easily tell when a recruiter visits your site. Wistia will tell you the url that the person watched the video on. This way you can tell how long a recruiter was engaged with your demo reel. You can see what professionals think of your reel compared to the general public. Once you have loaded the video player your web site send it out to your friends and family. Send your public link to people on facebook, twitter, linked in, or whatever other social media channel you like to use. Then wait… you are now collecting data from everyone who visits your demo reel! Now no one can lie to you. How? If they get uninterested and leave you know! Now you can see how people really view your demo reel. On the page you should see your video to the left next to a big graph. If you take your cursor and move it around the graph you can how many people watched your video till that point at any given time. I have included a screen shot that shows half way through my demo reel I have about 68% of the people still watching, or 52 viewers. The awesome thing is, if you click on the graph your video will jump to that point in time. We can see when users leave your video and what shot bores them! Below the graph you can see how users interacted based upon IP address. If you require users to fill out their email (which is set in the player settings), it will appear here. You can see when they stopped watching your video. When you hover over the graph to the right you can see what URL the individual engaged your video. You can see this in the screenshot below. If you have two URLS and you only send one to recruiters you can then tell who is a recruiter and who isn’t.. Also, unless you are sending your reel to millions of production companies a day, you can probably guess which company they are from. Animation Demo Reel Tips – What can Wistia Tell you? Through the use of Wistia.com you can data mine friends and family for information about your reel. You can see when people get tired of your shot. For example if a new shot happens at 0:22 and people 30% of the users leave, perhaps you should replace that shot on your reel. Also, by setting up two separate URLS you can see how recruiters view your shot. You can see if they watch the whole thing, if at all. For example, if you send out your resume and reel url to a bunch of recruiters yet no one seems to be watching the video (based upon the analytics in Wistia) then perhaps you should take a look at your resume. Maybe your cover letter or resume is turning people away. While Wistia will not let individuals critique your reel it does offer other amazing tools. Wistia should not take the place of these other tools. I suggest placing your reel on social media sites like youtube and vimeo, while testing with Wistia on your own site. 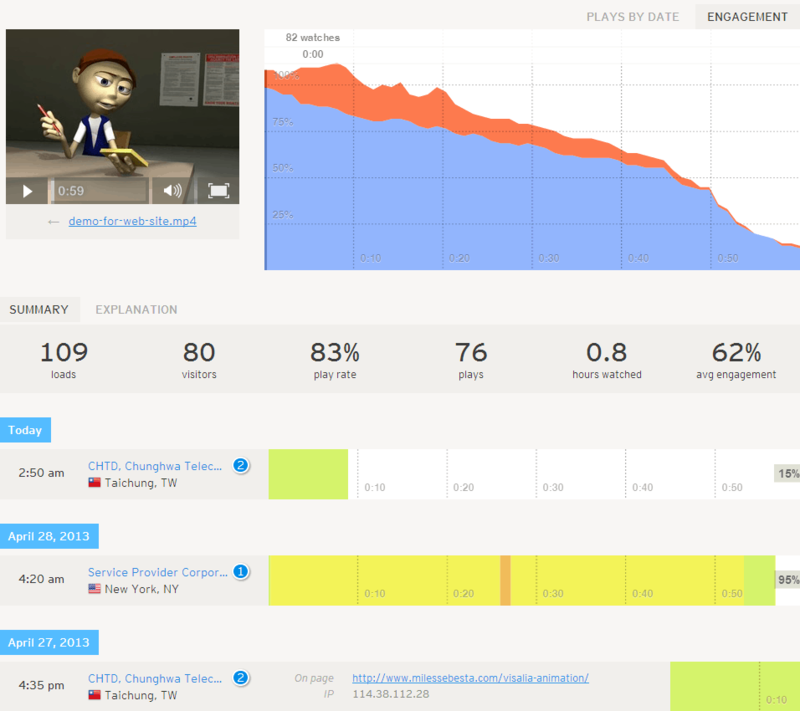 Wistia lets you view visitors’ behavior. You can see when random viewers leave and the actions they took. This will allow you to understand where you need to improve. Along with this Wistia gives some great social media, email marketing, and call to action tools. If used correctly Wistia can provide you with insight on how others view your reel. Hopefully you found this animation demo reel tip helpful. Please let me know if you have any questions. Also, send me an email if you would like to suggest a topic for any animation demo reel tips. I would also suggest looking at my list of best animation lectures or best character animation books.